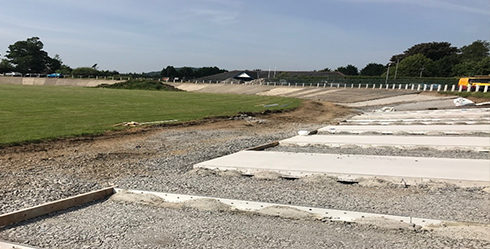 It is hoped a new state of the art resurfacing of the velodrome at Carmarthen Park will ensure it attracts international level cycling events and ensure the venue’s iconic stature for years to come. Contractors are on site at the 117 year old site in the heart of the park and work is expected to take 20 weeks, with a target completion date of September 29th 2017. Since the park and velodrome opened on Easter Monday 1900 it has hosted many important community events in the past century including cycle races, fetes, agricultural fairs, fairgrounds, firework parties, events celebrating the Festival of Britain, and Carmarthen’s two National Eisteddfods. Longer than most indoor velodromes, the fact that the town’s velodrome has remained largely intact and unmodernised for so long is a marvel to historians and cycling aficionados who have visited the track to document it and of course ride it in recent years. Planning consent was granted in April and a formal tendering procedure was then undertaken resulting in GD Harries and Sons Ltd being appointed as the sole contractor. Councillor Alun Lenny continued: “The project has taken a few years to get to this point due to the uniquely challenging nature of the work involved. On top of that we had to consider very carefully the right type of surface for the redeveloped velodrome, making sure that public money is being spent in the most cost effective and appropriate way. “Several different types of surface had to be tested by cyclists during the last year and ultimately this has resulted in the decision to replace all of the existing concrete – 232 concrete bays – with brand new concrete that hopefully will last another hundred years or so. In line with the above requirements, Kform’s K135 screed rail system was chosen by G D Harries and Sons for its ability to allow fast placement of the concrete surface along with high levels of accuracy. The ongoing project was today filmed by the BBC for a news article highlighting the historical significance of work.